Wed Jul 31 14:47DM@Eriklavier Yeah! That's from last November! Wow, how did you find it? Mon Jan 07 03:03Thanks @PeterPlaysPerc !! Wed Nov 14 15:08Thank you all who came to the CMS concert last night. So great to see friends afterwards - It was a blast! Tue Dec 13 13:52...And UMass Percussion Studio had a great time at Zildjian company last Friday. Thanks to Keith Aleo! Tue Dec 13 13:49Congratulations on UMass Percussion Ensemble last Wednesday. They performed incredibly well. I am so proud of them! Tue Nov 15 13:56had a wonderful time at PASIC! Mon Oct 03 13:34visited Yale with her students. Mr. van Sice's teaching is always inspiring. 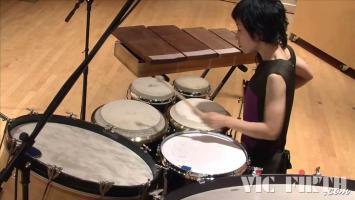 Percussionist and marimbist Ayano Kataoka is known for her brilliant and dynamic technique, as well as the unique elegance and artistry she brings to her performances. A versatile performer, she regularly presents music of diverse genres and mediums. Last season, together with cellist Yo-Yo Ma at the American Museum of Natural History, Ms. Kataoka gave a world premiere of Bruce Adolphe's Self Comes to Mind for cello and two percussionists, based on a text by neuroscientist Antonio Damasio, and featuring interactive video images of brain scans triggered by the live music performance. She also performed Leon Kirchner's flutings for Paula for flute and percussion with Paula Robison for Mr. Kirchner's 90th birthday concert at Miller Theater in New York and at the Isabella Stewart Gardner Museum in Boston. Recent highlights include a theatrical performance of Stravinsky's Soldier's Tale at the 92nd Street Y with violinist Jaime Laredo and actors Alan Alda and Noah Wyle, performances of Bartok's Sonata for Two Pianos and percussion at The Chamber Music Society of Lincoln Center with pianists Emanuel Ax and Yoko Nozaki, and a performance for the Sonidos Latinos concert series at the Caramoor Music Festival with Paquito D'Rivera. This past summer she presented a solo recital as part of the prestigious B to C (Bach to Contemporary) recital series at the Tokyo Opera City Recital Hall, which was broadcast nationally in Japan on NHK television. Her performances can be also heard on Deutsche Grammophon, Naxos, New World, Albany, and New Focus Records. A leading proponent of contemporary repertoire, Ms. Kataoka has participated in several consortiums to commission works for solo marimba or chamber ensemble from such composers as Charles Wuorinen, Martin Bresnick, Paul Lansky, and Alejandro Vinao. She is particularly drawn to compositions that involve the whole person, using standard percussion instruments and unique musical materials along with spoken voice, singing, acting, and elegant props. She has given numerous performances and master classes throughout the U.S. and Canada as a member of the Sylvia Smith Percussion Duo featuring Stuart Saunders Smith's percussion/theatre music, at such educational institutions as the Eastman School of Music, Oberlin Conservatory, University of California San Diego, New York University, Stony Brook University, the University of Illinois at Urbana-Champaign, University of North Texas, Bowling Green State University, and the University of British Columbia, among others. Ms. Kataoka also appeared as an onstage musician with a small acting part in the Yale Repertory Theater production of Shakespeare's All's Well That Ends Well. A native of Japan, Ms. Kataoka began her marimba studies at age five, and percussion at fifteen. She started her performing career as a marimbist with a tour of China at the age of nine. She received her Bachelor of Music degree from the Tokyo National University of Fine Arts Music, her Master of Music degree from the Peabody Conservatory, and her Artist Diploma degree from the Yale School of Music, where she studied with world-renowned marimba virtuoso Robert van Sice. She was the first percussionist to be chosen for The Chamber Music Society of Lincoln Center's Chamber Music Society Two, a three-season residency program for emerging artists offering high-profile performance opportunities in collaboration with The Chamber Music Society. Ms. Kataoka joined the faculty of the University of Massachusetts Amherst in 2008.